Since we are going to talk about silence – an undertaking which some might argue is self-contradictory – we must begin by appreciating the great value of speech. Both Jewish philosophers and kabbalists define man as medaber, the “speaking being.” Speech endows us with one of our most precious assets. And one of the first things the Torah tells us is that God created the universe through the Asarah Ma’amaros, Ten Divine Sayings, which are the very essence of speech. So when we speak – if we speak in a holy manner, words of Torah and tefillah, words of truth and compassion and faith – we become attuned to something deeply rooted in our own nature and in creation. 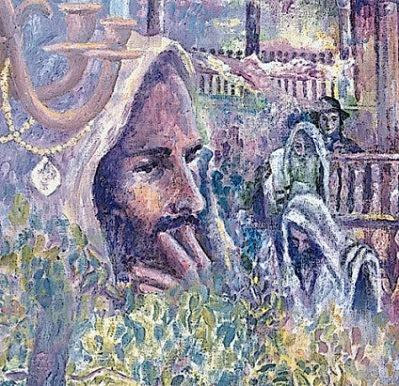 In propounding his path of self-realization through hisbodedus (secluded meditation and prayer), Reb Nachman tells us to speak to God in our own language at length, without holding anything back (Likkutei Moharan I, 52; ibid. II, 25, et al.). The efficacy of this practice is due to the sanctity and power of speech. He also states, “Holy words are the Shechinah, the Divine Presence . . . God’s Kingship and the truth of His existence are revealed through them” (Likkutei Moharan I, 78). Just as the Shekhinah is the emtzai, the intermediary that unites Creator and creation, speech unites self and other, as well as the inner and outer aspects of each human being. Both intermediaries are luminous, radiating wisdom. In fact, the Zohar states that the Shekhinah and speech are part and parcel of one another (Zohar III, 230a, 291b). In the works of the Baal Shem Tov, a key mystical practice is deveykus b’osiyos, binding one’s thoughts to the letters of Torah and prayer, thus to perceive what he describes as the “lights within the letters” (e.g., Rabbi Yaakov Yosef of Polonoye, Toldos Yakov Yosef, Vayeitzei, cited in Sefer Baal Shem Tov, Va’eschanan, no. 36; also Sefer Baal Shem Tov, Bo, no. 5). This concept appears in Breslov seforim, as well (e.g., Likkutei Moharan I, 94, which is an important discussion of the nature of holy speech in general). However, just as letters require the white space that surrounds them in order to be recognizable, so speech goes together with silence. This is especially true in spiritual practice. Thus, not only speech but silence, too, is part of Reb Nachman’s path of hisbodedus (secluded meditation) and deveykus (cleaving to God). Silence is associated with the sefirah of Keser / Crown, which transcends creation. This is the kabbalistic meaning of the Mishnah, “Silence is a fence for wisdom” (Avos 3:13). Like a fence, Keser / Crown “surrounds” the sefirah of Chokhmah / Wisdom from which the rest of the array of sefiros devolve (Likkutei Moharan 6:5, 15). Thus, through silence one can connect to the level of Keser / Crown, which is beyond all form and division – and beyond words. “From this we can learn practical advice: When the Evil One overwhelms us and disturbs us with all sorts of evil thoughts and confusions that we cannot seem to overcome – that is when we should nullify ourselves. “Everyone can accomplish this, at least from time to time. Simply close your mouth and your eyes and clear away your thoughts, as if you possess no intellect or reason, and nullify yourself completely before God” (translation from my anthology of Breslov teachings on the mystical experience, The Tree That Stands Beyond Space, Breslov Research Institute, p. 15). “Every Jew must become a Merkavah, a vehicle for the Divine Presence. As our Sages say, ‘The tzaddikim are the Merkavah.’ This is attained through sanctifying the mind, which is the essence of a person. (1) In this manner, one may be incorporated into the highest level of the Merkavah: the paradigm of the ‘man sitting upon the throne.’ When one focusses his thought on God, not allowing it to stray beyond the bounds of holiness, one accomplishes the unification of the Merkavah. So we see that intense concentration on God enables one to rise above all conflicts and difficulties and connect to the Shekhinah. This requires hiskashrus, or forging a spiritual bond with the tzaddikim, because they personify the goal for which we are striving; and given the devotion of the tzaddikim to elevate the world, they can enable us to actualize our potential. In a related vein, in Likkutei Moharan I, 65:3, the Rebbe observes that when we are in pain, we close our eyes instinctively, as if squinting in order to see a faraway object. The “faraway object” we ultimately seek is the World to Come, which is the world of unity, beyond all conflict; closing the eyes entails bittul, self-nullification, the prerequisite to this perception. And when the ego is nullified, there is no suffering (at least not existential suffering). The $64,000 Question (I know I’m dating myself – Reb Ozer Bergman says that the price has now inflated to $1,000,000) is: Why are these solutions only b’dieved, measures to be taken when all else fails? Part II of this posting will attempt to answer this question. (1) A friend who proof-read this posting asked me what Reb Noson means in this context by “sanctifying the mind (taharas ha-machshavah)” I’m tempted to say that he means to clear the mind of thought, as in Berakhos 2a-b, where the sky is described as being tahor, “clear” or “erased” of light when evening falls; it is hard for me to accept that he simply means to think only “good” or “holy” thoughts. The first approach would be a more meditative way of understanding Reb Noson’s words, which fits the broader context of his teaching. But I’m not sure. A key to this question would seem to be the Rebbe’s similar reference to taharas ha-machshavah / purifying or clearing the mind in Likkutei Moharan I, 234. There, he states that negative thoughts are the result of mochin de-katnus / “small mind,” or constricted consciousness; the way to attain taharas ha-machshavah, purity of thought, is therefore by attaining mochin de-gadlus / “big mind,” or expanded consciousness – which also goes along with clearing the mind. The Rebbe takes up the subject of silencing the mind in this lesson – but he also stresses becoming cognizant of God’s constant providence and sovereignty in all times and circumstances, particular by hearing the stories of the tzaddikim and the things that happened to them (which reflect more intense manifestations of divine providence). Great post. What I did was I went to http://www.subconscious-mind.org. From there, I followed the tips and guides that they offer on improving your brain power.Well, I tried and I definitely can see some improvement in my condition. So, you should consider trying it too.